China’s top diplomat said Thursday that an initial draft of a proposed pact with Southeast Asia aimed at preventing fighting in the disputed South China Sea was a “breakthrough” in talks that can progress further without outside interference. China and the Association of Southeast Asian Nations, which includes four rival claimants involved in the territorial rifts, have been holding sporadic talks for years to craft a “code of conduct,” a set of regional norms and rules aimed at preventing a shooting war in the disputed waters. Huddled among themselves in a separate meeting earlier, the ASEAN foreign ministers praised the completion of the draft. Some of the ministers, however, were expected to repeat their concerns over China’s transformation of seven disputed reefs into man-made islands, including three with runways, which now resemble small cities armed with weapons systems, including surface-to-air missiles. 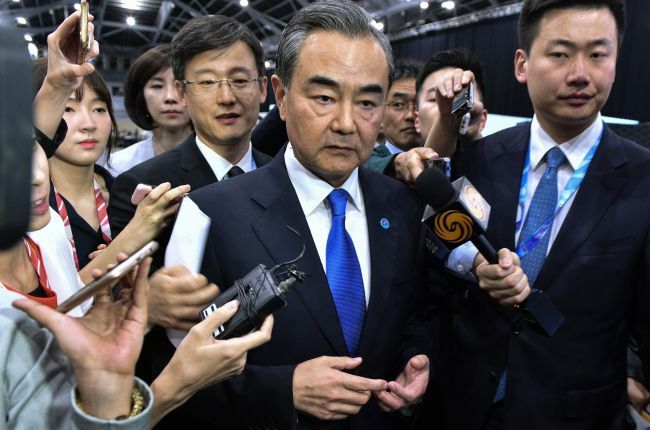 China has come under intense criticism for the militarization of the strategic waterway, but has said it has the right to build on its territory and defend them at all costs. The ministers “took note of the concerns expressed by some countries on the land reclamations in the area, which have eroded trust and confidence, increased tensions and may undermine peace, security and stability in the region,” the draft communique said, without naming China and reflecting the internal divisions over the touchy issue. ASEAN members Cambodia and Laos, which are known China allies, have opposed the use of strong language against Beijing over the disputes. Vietnam and Indonesia have backed stronger rhetoric against China’s assertive actions. “There will be the inevitable differences, if not tensions, within ASEAN on what should be in the document. You have claimant and non-claimant states. You have countries with very close ties with China and those more cautious of China,” said Eugene Tan, an associate professor of law at Singapore Management University. “A meeting of minds is essential to set the stage for the arduous road ahead,” Tan said. Aside from China and Taiwan, ASEAN members Brunei, Malaysia, the Philippines and Vietnam have had overlapping claims in the South China Sea, where a bulk of the commerce and oil that fuels Asia's bustling economies transits through.